Sirius provides a set of components used to build modular and scalable Java applications. 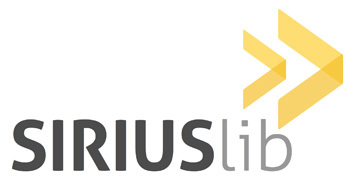 Sirius was created by scireum GmbH as foundation of our web based applications. Being advocates of open source software, we decided that a stable and reliable framework, used in production environments might be useful to others. The library is split into several modules to make it useful for different audiences. Sirius not only supports Dependency Injection but it takes it to the next level. It embraces a programming style called "Discovery Based Programming" which permit to provide services that discover their users at runtime. See the list of Examples within Sirius. Keep it simple and stupid: No classloader ticks. No magic implicit variables coming from god knows where. No bytecode rewriting. No layers of indirection if not needed. By providing loose coupling via IoC-Patterns (inversion of control) like discovery and dependency injection, Sirius permits to write modular, maintainable and testable software with clear responsibilities. Sirius can be started in any IDE/Debugger just like any normal Java appplication. As no classloader or bytecode magic is used, class reloading in the VM works a treat. To further save precious developer time, the framework starts ultra fast. Having a server up and running in less than two seconds drives productivity above level 9000! There is quite a difference between software which is built and engineered for a single customer and software products which are used by many customers. The latter need more flexibility when it comes to configuration. Also a mechanism to manage customer extensions is required. Both is provided by the Sirius Kernel (Docs). Also, the discovery based style of Sirius permits to reuse common services across multiple independent products in an easy way. Running critical servers in production environments forces you to instantly know, what's going on in the system. The exception handling system provided by Sirius provides excellent insight, while neither getting jammed by reoccurring errors nor missing any important message. Leveraging the dependency injection framework, every application creator can decide where and how to collect those errors. Using the built-in profiler, central activities can be inspected in running production systems with almost no overhead. We at scireum build several products which all share quite a large part of their functionality. So we needed a flexible and simple mechanism to build reusable modules. One example would be the TimerService which calls functions in a regular interval. Now if we try to implement the actual timer service, we run into the problem that we don't know which implementations of our TimedTask exist (each product has different tasks to do). To still make this functionality reusable, we obvisouly cannot specify a list of classes. The only other alternative would be to have a startup handler which registers each implementation at the timer service. First of all, this would be against DRY (don't repeat yourself), also, a complex product would have quite a lot of such extensions to framework services, so this startup handler would be quite complex. Another problem arises when we split our product into several modules. In this case we'd have many startup handlers and again would need to known which to call. // TODO: Who is responsible for calling this at the right time? So what we need is a framework that brings together what belongs together. This is esentially what the micro kernel of Sirius does. As our implementation implements Lifecycle and also wears a @Register annotation it is also discovered at system start. Once all classes are loaded, the started method of all lifecycles are invoked which will then start our timer. Once this triggers, we iterate through all available implementations of TimedTask (automagically filled by the framework via the @Parts annotation). Now all a consumer of this service has to to is implementing the interface and placing an annotation to make it visible to the framework. This inversion of control permits loose coupling for modular software. Provides the micro kernel based discovery and dependency framework along with common helper classes and core services. Scans the classpath and brings services and their consumers together. This runtime linking provides loose coupling and helps to build reusable services. See DI Package for further information. Uses the Typesafe Config Library to load a set of config files. This encourages to provide readable default config in the component configuration which then can be overridde by the application config, a customization or the instance configuration. 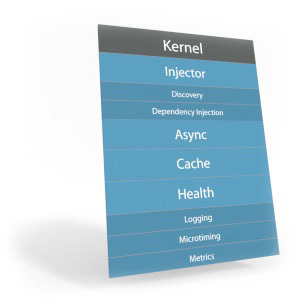 See Kernel Package for further information. The Java APIs need some extensions here and there. Those are provided as helper classes like Strings or Value. See Commons Package for further information. Native language support made easy (or at least bearable). The NLS class loads all .properties files at startup and makes them accessible via NLS.get(key) or NLS.fmtr(key). The latter provides a formatting tool which uses named parameters instead of numbers - your translator will love you for using it! Provides a uniform approach for exception handling and logging. Also contains tools for runtime profiling and monitoring. See Health Package for further information. Caching without crashing! Provides a simple caching API which also takes care of validation and eviction. This helps to scale fast without sacrificing resources forever. See Cache Package for further information. Provides managed thread pools, which help to monitor and control system load. See Async Package for further information. The functionality provided by Sirius is split into frameworks which can be dis- or enabled. This permits to use a module in a project without having to use all of what's provided. Customizations help to develop and maintain customer extensions in one code base. Placed in specific packages, these can be enabled at startup as required. See Kernel Package for further information. Uses Netty to setup a HTTP server supporting keepalive, chunked transfers, smart upload handling, connection monitoring, and a firewall. Usign Rythm templates and Controllers it provides an intuitive way of building modern web apps. Provides a fully asynchronous web server based on Netty. Smart content compression is automatically enabled as well as the zero copy capabilities of Netty. A built-in firewall helps to block or filter unwanted traffic at early stages (before all HTTP processing). Sirius provides a set of basic dispatchers which can be extended or overridden by the application. The framework speaks JSON and XML fluently. Of course next to HTML also JSON and XML can be generated as a response. 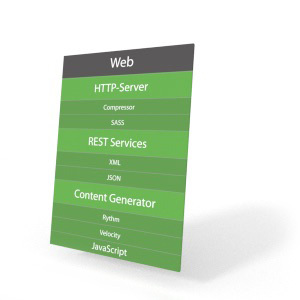 Need to provide an REST API or working withing a microservices architecture? By implementing StructuredService, a service end point is provided which either replied with XML or JSON (depending on the incoming URL). Provides a fluent API around Javamail which utilizes the system configuration for the SMTP setup and the definition of mail templates which can then be sent to receivers. See MailService class for further information. Provides a framework for user authentication and authorization along with permission profiles and helper classes. Also basic user managers using LDAP or the system configuration to identify users are available. See Security Package for further information. The content engine has also an extensible resource lookup mechanism which is used by all Sirius components. See Content class for further information. Provides a super thin layer above JDBC adding idiot-proof connection management, DBCP as connection pool as well as profiling for all queries. 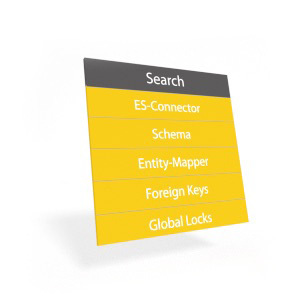 Provides pooled access to JDBC databases configured via the system configuration. Using SQLQuery, JDBC queries are executed with automatic connection management and smart query generation. 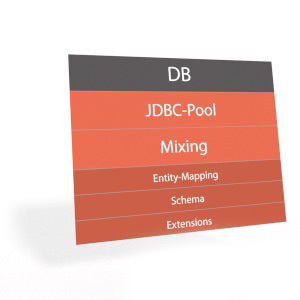 See JDBC Package for further information. Mixing is a next generation ORM. It supports a thin and efficient mapping layer between classes and database tables without compromising performance. Its largest benefit however is the support of "Mixins" which permits to extend existing tables and classes on a "per customization" or "per product" basis. This permits to re-use base classes or to add customer specific fields into standard products. Provides a ORM like API for Elasticsearch. Provides a framework for loading and saving POJOs into Elasticsearch. Also a fluent query API helps to build flexible "SQL like" queries. See Search Packages for further information. The schema is autocreated at system startup based on the entities discovered. See Schema class for further information. 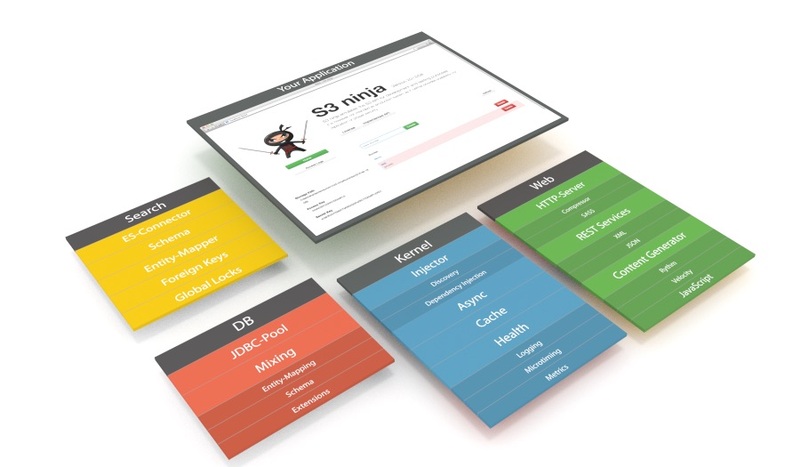 S3 ninja uses the kernel and web module to provide an emulator for the S3 object store API. The Sofware Distribution System uses the kernel and web module to provide rysnc like software updates via HTTP(S). scireum GmbH uses Sirius for all of their Java based software projects, including cloud based web applications and e-commerce systems. An overview of all versions can be found in the Sontype Repository. All releases are also available via Maven Central.